# We're going to use datetime aligned versions of the dataseries. # These are used only for plotting purposes. # These is used only for plotting purposes. elif zScore <= -2 and currentPos == 0:  # Buy spread when its value drops below 2 standard deviations. 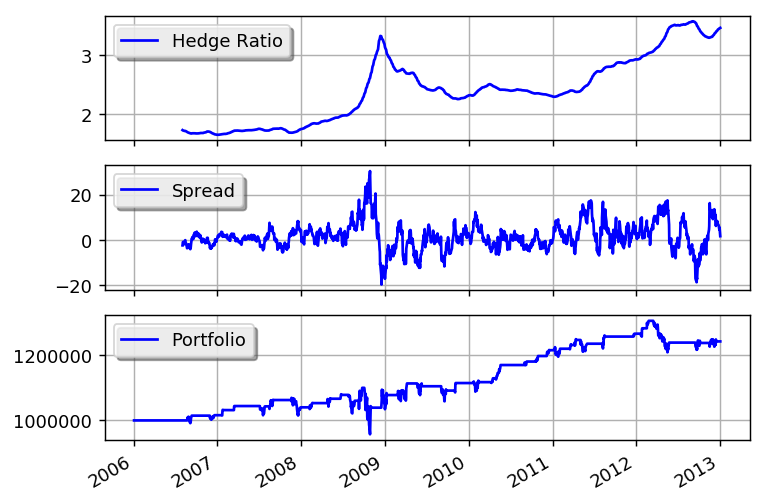 elif zScore >= 2 and currentPos == 0:  # Short spread when its value rises above 2 standard deviations. You can get better returns by tunning the window size as well as the entry and exit values for the z-score.